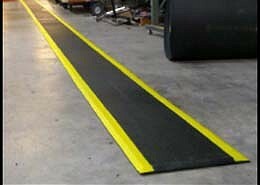 Let us know how we can help with your Anti Fatigue Mat requirements. While Ortho Mats are made in the US, this might be an issue on orders shipping to China. Hope we get this stuff settled soon. Ortho Mats over 6' in length will be considered "runners" and carry a different cost. They are available in 22", 24", 36", 42", 44" and 48" widths. Call or email with your requirements for a specific proposal. Mighty Line Floor mats are now available, call for details. Check out this short video.